The artist: Geddy Lee is best known as the bassist and vocalist for Canadian-rock trio Rush. Forty years into its career, Rush has amassed a slew of deserved achievements, including a star on the Hollywood Walk Of Fame and an induction into The Rock And Roll Hall Of Fame. Rush had humble beginnings in Toronto, finally catching a break with the single “Working Man,” from the group’s 1974 debut album, before going on to become some of the most precise musicians playing today. Recently, Lee, guitarist Alex Lifeson, and drummer Neil Peart concluded Rush’s R40 tour commemorating the band’s longevity, and celebrated by releasing Rush R40 LIVE, which was recorded and filmed over two sold-out shows at the Air Canada Centre in the band’s hometown on June 17 and 19. We caught up with Lee to talk about a few of the greats from such a remarkable career. 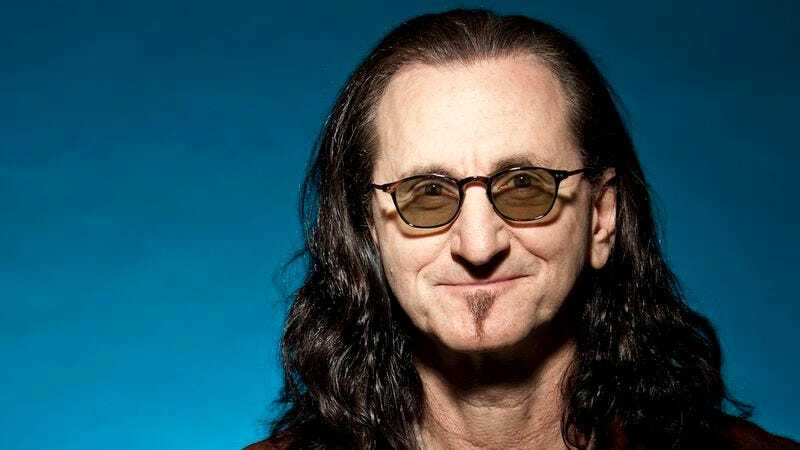 Geddy Lee: I think one of the best songs we’ve written in a really long time is a song called “Headlong Flight,” and it’s a personal favorite of mine from Clockwork Angels. It just seems to have all the quintessential Rush elements in one song, and yet it has a kind of energy and ferocity that we don’t always capture on a recording. The A.V. Club: What would you say the quintessential elements are? GL: It has sort of pyrotechnic playing, it has kind of blues-based riffs, and it has maddening time changes and unpredictable changes of scene and fiery solos. It’s got all the stuff we like to do. AVC: You opened up this year’s R40 tour with another Clockwork Angels track, “The Anarchist.” Is that another favorite? GL: Yeah, that might be one of the strongest songs we’ve written in a long time. It’s got the type of tempo and energy that sits somewhere between over-the-top and laid-back. It’s right in that power range; we don’t work in that tempo all that often. We have a tendency to work really fast or get kind of mellow, so whenever there are these midtempo, slightly more than midtempo rockers it always feels like a breath of fresh air. That song came together in a very interesting way in terms of writing it with Alex [Lifeson] in my home studio. I’m just really pleased with the details that came out in it. AVC: What do you consider a comparable song from your earlier work, tempo-wise? AVC: Speaking of “Big Money,” feel free to talk about literally any track from Power Windows. That album is one of the best among an accomplished catalog of greats. GL: It’s one of my favorite albums as well. I was particularly pleased when we finished that album because we had been experimenting, and kind of struggling, with different ways of approaching a combination of rock and synthesizers, and on that album we found a really nice balance so the band still had that power rock thing that we love and that is really essential to us, but we were able to bring in all kinds of nuances by using more contemporary synthesizers. I think it’s the first time we used [composer and keyboardist] Andy Richards who came in as our keyboard extra guy. That was a really interesting influence. He was sort of Trevor Horn’s [of The Buggles, Yes, etc.] main synthy guy. He was sort of the synth god du jour of that period in England. AVC: That would have only been a few years after The Buggles’ “Video Killed The Radio Star,” saw major success, too, and right around the time Frankie Goes To Hollywood became popular. GL: Yes, that was right after Frankie Goes To Hollywood [a band both Horn and Richards worked with] hit big, and we were mixing Power Windows in the studio Trevor used all the time. So it was sort of an in-house situation. AVC: Let’s talk about a song off the album that came next, Hold Your Fire’s “Time Stand Still,” which is the only Rush song that includes guest vocals—courtesy of Aimee Mann. GL: When we wrote that song, I just became obsessed with having a female vocalist come in and add a different nuance to it. We talked about a lot of different vocalists. At that time I was a big fan of Kate Bush, and I’ve always been a big Björk fan. Somebody suggested Aimee Mann, and we listened to her work. Her voice is absolutely beautiful and really possessed a lot of the qualities that we were after, and she was thrilled to come up to Toronto and lend her talents to our song, which I think really elevated the track. She’s such an awesome person and we had a ball with her. AVC: Is there a particular song of Aimee’s that impressed you when you were going through her music? GL: Well, since then, of course, I’ve become a big fan of her work and especially the work she’s done on the Magnolia soundtrack; that is just really some beautiful stuff. But at the time we were just drawn to the sound of her voice. She had that big hit song. AVC: “Voices Carry” with ’Til Tuesday. GL: Yes, “Voices Carry.” Then we listened to the whole record just to get familiar with the texture of her voice and we were very, very impressed with her. AVC: It’s the highest charting single of your career, actually. GL: Pretty much, pretty much. That was so fun. I knew one of the guys from public school. Rick Moranis [the performer who portrayed Bob McKenzie] and I went to school together when we were really little. For about six years in a row, we were in the same class. And then when he was getting involved in that whole Bob and Doug thing, and it was really starting to become successful, they wanted to do this sort of pop song, and they naturally thought of me, which was nice. I went down to the studio and we put that together in 15 minutes or something. [Laughs.] It was really just off-the-cuff. The producer said, “Here’s the lyrics—have a go. The guys will be in a studio with you and you can just kibitz with them, and we’ll record everything.” And [Moranis and Dave Thomas] were in character, and I was singing with a toque on. AVC: Speaking of off-the-cuff, you actually wrote the lyrics for the first Rush album on the spot, correct? AVC: As someone who isn’t primarily known as a lyricist, what was that like? It was like, okay, we’ve got like two days left of studio time. That’s all we could afford, so I had to sit down and write the lyrics basically for the next two days and sing them as soon as one was written. AVC: That makes the opening track, “Finding My Way,” a very appropriately titled song. AVC: What about “Working Man,” which is probably the best known song from the band’s debut? GL: “Working Man” is one of the first songs we wrote that people started to respond to. It was very influenced by our earliest influences—Cream and people like that. It was just sort of a blusey kind of jam song. We used to be big fans of Cream’s long version of “Spoonful” and things like that, you know, where you had this kind of bluesy song that went into this long jam thing. That was just kind of our version of that idea, and it stood the test of time pretty well. It’s aged pretty well. On this last tour, and especially on this DVD, we got an amazing version of it, and we were pretty much closing the show with it every night. To me it’s the period on the sentence in terms of talking about our musical past, and it’s this whole reverse chronology when we come back and finish with that song, it’s a big jam release for us to just not worry about anything and to just play. AVC: Another Rush staple is “YYZ,” which is well known for the drumming. With instrumentals like that, do you and Alex [Lifeson] sit down to write and then have Neil [Peart] fill in the gaps, or is it a full collaboration from the beginning? AVC: What’s it like with a shorter instrumental? For example, “Malignant Narcissism” sticks out as one of Rush’s shortest songs. How or when did you know it was finished? GL: We were doing that in at Allaire Studios in upstate New York near Woodstock. It was another one of those residential studios. It was a beautiful old house that had been converted into a fantastic recording studio. We had a lot of stuff done for the album and we kept talking about what’s missing, is there something we need? And our producer was pushing us to do something live off the floor in the studio, something really spontaneous, and I had just taken delivery of this Jaco Pastorius tribute bass, where Fender had made an exact replica of his fantastic fretless jazz bass and it had just arrived and I was dying to play it. I get really restless between vocal takes so I was doing vocals and in between takes I was playing with my new toy, my bass, and the producer was listening through my vocal mic to what I was playing and he was recording it in sort of a stealth way. [Laughs.] After I finished the vocals he said, “Listen to what you were playing in between vocal takes,” and he played me back the main riff of that song and said, “Why don’t you take that and get Neil and go live on the floor and start jamming to it and see what happens.” It was the same kind of deal where Alex wasn’t around for some reason, so Neil and I went in the studio on our own and started laying the track down, and then Alex came in and added his stuff to it afterward, and it just became a real spontaneous moment in the studio. AVC: Out of curiosity, how do you go about purchasing a new bass? What do you look for? GL: I look backward. I don’t look forward. I’m fascinated and obsessed with vintage basses. I’m always scouring the universe for great old instruments from the ’50s and early ’60s. That’s really, for me, the golden age of basses, when they had just been invented within 10 years of that period and they had just started to come into their own, especially the old Fender jazz basses and old Rickenbackers and Gibsons. I’m always on the lookout. It’s fun. AVC: What was it like to write without Neil and Alex? GL: That was a real interesting period for me. It was tough because I had planned to do some jamming with my dear friend Ben Mink who is an amazing musician, producer, and songwriter in his own right, and a violinist and guitarist. Because we had been friends for so long, and we had never actually made a record together aside from him playing on the song “Losing It” from our Signals album, we had always planned that some time when the band was on a break, we would just get together and start writing together and see what happened. We were planning to do that, and suddenly tragedy struck Neil’s life. His daughter was taken from him in a car accident, and everything got really weird and it was just a horrible period. So I decided after a few months this idea of working with Ben might be a real tonic for me, because I didn’t know really whether there would ever be another Rush album. I had no idea; it was not something we were focused on, and people get through tragedies in different ways. I was kind of going crazy and needed something to focus on, so this project that was sort of in the back of my mind with Ben suddenly became critical so we started getting together in my home studio in Toronto and I would go to his place in Vancouver and over a series of months we gathered a whole bunch of material together and then we decided to go for it and make the record. AVC: Would you ever consider making a solo album again? GL: Yes, I would. Definitely.